Marc Lescarbot is not a name typically associated with Florida—or with poetry, for that matter. Born in France circa 1570, Lescarbot was raised in a wealthy Catholic family and educated to become a lawyer. Though the law remained his profession for the entirety of his life, he is perhaps better remembered as an author. Among his works are poems such as “Adieux a la France,” translations concerning history and politics, and Le Théâtre de Neptune, which is credited as the first European theater piece performed in the Americas. The best known of all Lescarbot’s works is his three-volume Histoire de la Nouvelle France (1600), first published in the wake of his journey to Acadia, on what is now the eastern seaboard of Canada. Lescarbot never traveled to Florida during this voyage nor set foot in Brazil. Both regions feature notably within the work, however, as he detailed the efforts of the French nation to maintain a foothold in the western hemisphere. The works below are taken from an appendix to the history. The poems concern a part of the French-Spanish conflict that does not feature prominently in Florida’s history. In 1568, roughly three years after the Spanish massacre of the French Huguenots at Fort Caroline, captain Dominique de Gourgues (also spelled Gourgue) led a revenge expedition against the Spanish who installed themselves at the same fort, renamed San Mateo. Corresponding with the events in Lescarbot’s Histoire, the key figures within the poems are captain de Gourgues, his lieutenant named Cazenove, and Olotocara, the nephew of a Native American chief named Satouriana. The first poem is dedicated to the memory of captain de Gourgues. No particular name is given in the dedication of the sonnet which follows the Gourgues poem, but the content of the text indicates that Olotocara is the “savage Floridian” whose memory is being lauded. 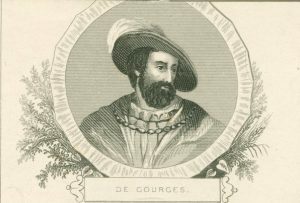 Lescarbot is one of only a handful of authors known to have written about Dominique de Gourgues and his expedition against the Spanish. In his Histoire, Lescarbot mentions that the captain became a national hero in France, following the 1568 revenge attack. But the fame seems to have been short-lived, and little documentation has survived to mention him. According to Lescarbot, as well as Francis Parker (1832-1893) and Charles E. Bennett (1910-2003), the voyage was not sanctioned by the French crown, and was funded independently by the captain and those close to him. This may, in part, explain the lack of documentation. Nevertheless, the story of French success in Florida better fit the patriotic theme of Lescarbot’s Histoire than did a massacre, and so the narrative of captain Gourgues lives on in verse. In the selection below the French poems are presented, followed by English translations. Spelling and punctuation has been maintained from the 1612 edition of the text, but punctuation has been added. Bennett, Charles E. Laudonnière & Fort Caroline: History and Documents. Tuscaloosa: U Alabama P, 2001. “Dominique De Gourgue.” The Illustrated Magazine of Art 4:23 (1854): 291. Lescarbot, Marc. The History of New France. Vol. 1. Transl. William Lawson. Toronto: Champlain Society, 1907. __________ . Les Muses de la Nouvelle France. Paris: Chez Millot, 1612. Parkman, Francis. Pioneers of France in the New World: France and England in North America Part First. Vol. 1. New York: Little, Brown, 1901. “ODE EN LA MEMOIRE du captain Gourgues Bourdelois.” L’Histoire de la Nouvelle-France (1612), 1:19-20. Les beautez de la Floride. Puis que c’est toy qui commande. Qui sçais bien ce qu’il faut taire. Ilz les mettent au pillage. En fin sa troupe s’amasse. Since it was you who held command. Who knew that he must keep silent. In the end, his troupe amassed. All to hold their ground. Cruelty was far too fresh. To make them sentinel there. “La mémoire d’un Sauvage Floridien qui se proposoit Mourir pour les François.” L’histoire de la Nouvelle-France (1612), 1:20. Droit parmi nous estre immortel. Mourant pour l’honneur de la France. In defense of our quarrel? Right amongst us as to be immortal. In dying for the honor of France.